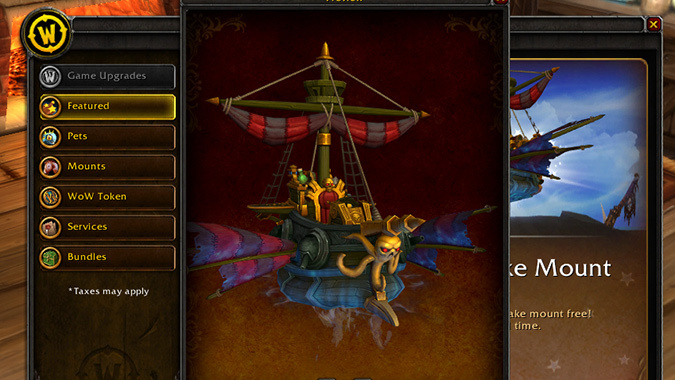 Blizzard are giving a free "pirate ship" mount away (and its "special action" involves firing its cannons!) to everyone who pays for 6 month game time. This includes those who already have a rolling 6 monthly subscription, as well as those who buy it through the store. The 6 months costs the same as normal, the price is not inflated .. so free mount! Remember to check your Gifts section on your launcher if you already pay for a six monthly subscription. This is a time-limited thing .. it ends on the 21st October. Haha .. I did exactly the same thing! Just as a note .. I found out today that strangely this particular pirate ship doesn't actually float on water! Pfft.